Dr. Hartig is certified by the American Board of Otolaryngology-Head and Neck Surgery. His practice combines traditional head and neck surgery with facial plastic and reconstructive surgery. He has extensive experience managing head and neck cancer, including tumors of the skull base, and performing microvascular free tissue transfer reconstruction. 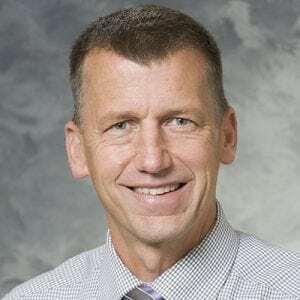 Dr. Hartig directs the head and neck oncology program at UW Hospital and Clinics. Dr. Hartig provides a wide range of services including Airway Dilation, Airway Reconstruction, Endoscopic Partial Laryngectomy, Esophageal Dilation, Free Flap, Free Tissue Transfer, Functional Neck Dissection, Laryngeal Surgery, Laser Procedures, Leukoplakia Laser Treatment, Maxilofacial Trauma Repair, Open Partial Laryngectomy, Thyroid Surgery, Thyroidectomy, Thyroid Lobectomy, Total Laryngectomy, Total Thyroidectomy, Transoral Robotic Surgery. Dr. Hartig has research interests in the cytogenetics of head and neck carcinoma, free flap physiology, and airway reconstruction. Personalized Treatment for Lacrimal Sac Adenoid Cystic Carcinoma: Case Report and Literature Review. A Comparison of E6H4 and G175-405 p16-specific Monoclonal Antibodies in Oropharyngeal Squamous Cell Carcinoma. Is HPV-Associated Oropharyngeal Cancer Becoming More Common in Older Patients? Pilot trial of the hu14.18-IL2 immunocytokine in patients with completely resectable recurrent stage III or stage IV melanoma.